Can’t believe we are on the doorstep of September. Here’s a video of five quick updates I wanted to share. I’m super excited about #5. 1. New book just launched – Bar Trick, Bad Jokes and Even Worse Stories is now out on Amazon. Amaze your friends and be the life of the party with over 101 tricks, riddles, jokes and stories. 2. Pink Goldfish – working with David Rendall on the next color in the Goldfish Series. The book will focus on how to stand out in business by amplifying weakness and embracing weirdness. 3. Nice Guys on Business- Honored to be a guest on the #1 ranked business podcast this week. Here’s a link for a listen. 4. minibuk 2.0 – the next edition of my minibuk business has arrived. Ask for one next time you see me. 5. StanPhelpsSpeaks – I just launched my personal speaking website. Click around and let me know what you think. Big thanks to Sarah Crawford of Sparkworth.com. Need a site? I highly recommend Sparkworth. 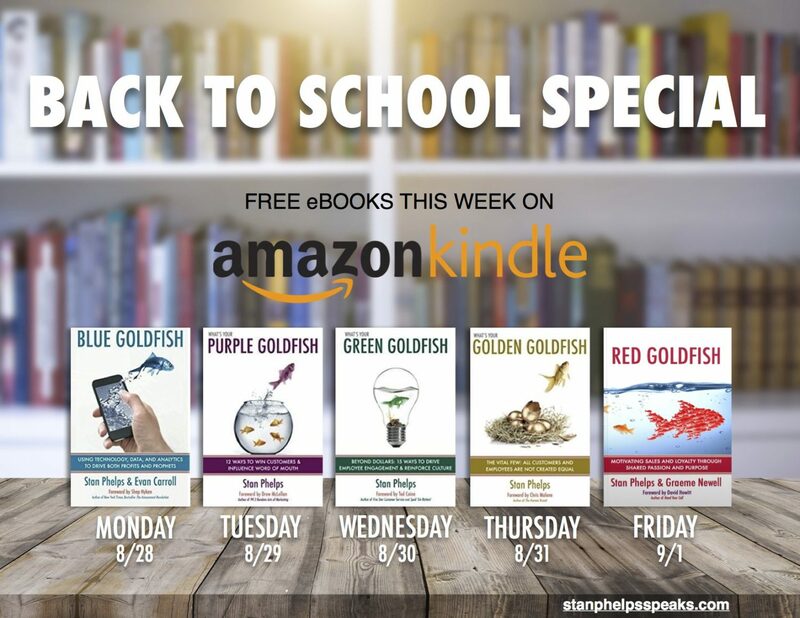 Lagniappe (a little something extra thrown in for good measure) – in honor of Back to School, I’ve made all five goldfish eBooks free. One each day this week. Simple enter Amazon and the color Goldfish for that day into your browser. No code necessary and you don’t need a Kindle. Just download the Kindle Reader App.